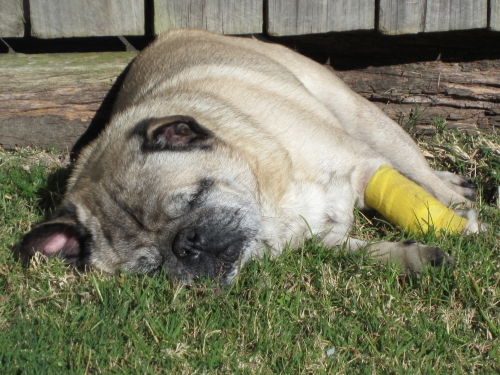 Today is the anniversary of the passing of my beloved pug Wolfy Maynard Wolfchild. While I miss him terribly, I am also inspired by the stoic way that he continued happily through both his treatment and the progression of the cancer that eventually took his life. Here is that story. The passing of a beloved pet is always tragic, even more so when you have to choose the time of the passing. How short is too short, how long is too long? Any time would be too short for me. 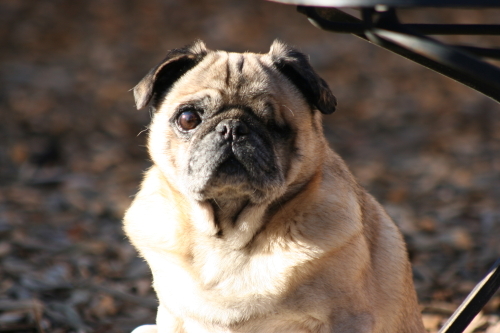 The thought of losing my beloved pug was killing me. The thought of never seeing him again, of never touching his soft fur or having him cuddle up to me when we watched television was beyond painful. We were charged with making that fateful and irreversible decision and the burden weighed heavily. Some dogs will let you know when they want to go but I knew that Wolfy would struggle to the end. He was the most stoic dog I have ever met. 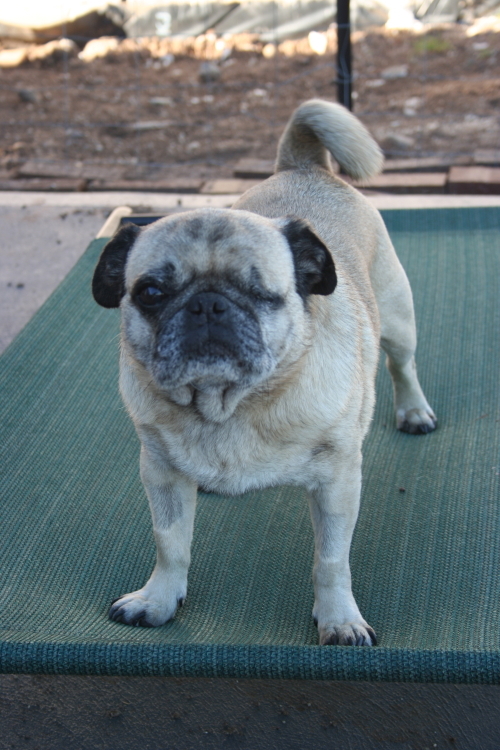 Wolfy came to me from a pug rescue with only one eye and was a bold, feisty little boy. Every challenge thrown at him he dealt with in a creative and courageous way. Yet it was his bravery and stoicism that were going to make the decision difficult. Wolfy became a part of our family in August 2007 and somehow, as his time came close, I knew that he would be leaving us in August 2013. August slowly wound to an end and I watched as Wolfy’s symptoms became more acute. We made the appointment to let him go on the evening of Friday, August 30. As the day arrived I prayed to the Pagan Gods I had almost lost faith in to give me a sign it was the right time, but none came. The almost two hour drive to the vet gave me plenty of time to question our decision. I felt bile coming up in my throat as we neared the destination. We had decided to take Wolfy and the rest of our pack for a final walk around Lilydale Lake. The lake is only a few minutes from the vet and has been a place we visit often with the dogs. Many a day has been spent sitting and drinking coffee in the park while waiting for one our dogs to finish having surgery. We drove into the darkened park and I said my final prayers to the Underworld Gods Hades and Anubis – please give me a sign. Surely they would understand. Hades has his own dog Cerberus and Anubis is … well he’s part Jackal! As we got out of the car we heard bagpipes start playing in the distance. It was surreal and haunting but more than that, it was a sign. One of my favourite television shows is Hamish Macbeth and in the tragic episode “Wee Jock’s Lament”, bagpipes are played at the little dog’s grave. As I listened to the bagpipes I cried and said “They are playing the bagpipes for Wolfy”. So began our pre-funeral march. We went for our final walk as a pack towards the darkened lake, glistening in the dim lighting. The bagpipes filled the air with sombre notes, nudging us towards our final task. Wolfy passed peacefully surrounded by his family and his pack. He died at 7.20pm, the same time that I was born. Another sign and another link that will bind me forever to my beloved Wolfy. As a life was taken, a faith was renewed. 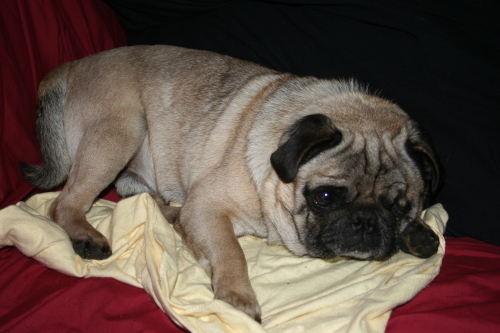 My pug friends say that Wolfy is at the Rainbow Bridge. My Pagan friends say he is in the Summerlands. My mother says he is in Heaven. I know that Wolfy is running wild with Cerberus and his pack. Until we meet again in the Elysian Fields. 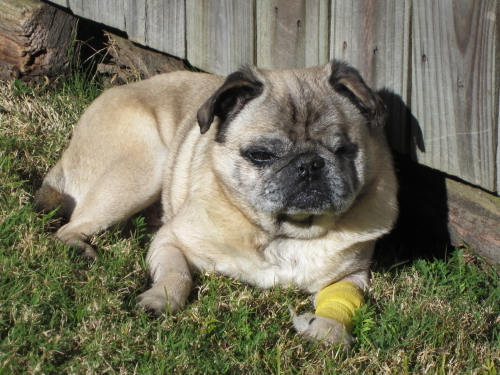 Wolfy was diagnosed with an inoperable nasal tumour in July 2011 and given three months to live. After the initial shock of his diagnosis things moved quickly. We were advised that radiation therapy could extend his life and that a twelve day stay in hospital with a daily dose of radiation – weekend off – could give him an extra six months or more. The best treatment centre was in Brisbane – two states and about 1,700km (1,000 miles) away. He could stay in hospital for the whole time or if we wanted to go to Brisbane with him we could pick him up for the evenings and just drop him off daily. After careful consideration we decided Wolfy should go to Brisbane. The decision was made easier by the fact that Wolfy was insured. We put Wolfy on a plane and worried the whole time. He arrived safely in Brisbane on Sunday night. I would be joining him in Brisbane on the following Sunday for his second week of treatment. I was picked up at the airport by Kathy, someone I had never met in person, but who I knew from OzPugs, a pug forum we were part of. She had picked Wolfy up from the hospital Saturday and he had stayed with her and her pugs overnight. I couldn’t get to her home quickly enough. When I finally arrived, Wolfy looked at home and seemed surprised, but happy to see me. He said hello to me and then went back to Kathy. She was surprised at his actions – I wasn’t. Kathy had been giving him treats and, like a typical pug, he went where the food was! But when it was time to go to our rental holiday home, Wolfy was happy to leave the treats behind and come with me. We spent the rest of the weekend together before his next round of treatment. I knew I would be too stressed to drive in Brisbane so I ordered a taxi to take Wolfy and me to the hospital in the mornings. I dropped him off on Monday and met the staff and specialist taking care of him. They loved Wolfy. They said he was such a character. He had spent the first week trying to teach one of the other dogs to stop barking by barking at him. Unfortunately the poor dog was deaf so Wolfy’s efforts were in vain. After leaving Wolfy at the hospital, I set about exploring Brisbane, making sure I would be back in time to pick him up in the afternoon. Two more Brisbane OzPuggers, Nat and Maree, also caught up with me. I got to meet Nat’s adorable pugs and she even took me on a cemetery tour. Maree had Wolfy and I over for dinner and introduced us to her family and pugs. These online friends that I had never met before were instrumental in making a stressful time not only bearable, but fun. The week passed quickly and while making the final preparations on Thursday night for our flight home on Friday afternoon I had a massive panic attack. Wolfy had his transport to the airport arranged and I was to meet him at the cargo depot, sign him in and then get to the airport to catch our flight. I could catch a taxi but they wouldn’t wait for me to do the paperwork – unless the meter was running – so I would have to walk to the airport. Normally the walk wouldn’t have been an issue but with the Brisbane heat, an uphill walk and a suitcase, I was terrified I would miss our flight. Paul came up with the perfect idea – hire a limousine! It was going to cost the same as a taxi but the the driver would wait for me to sign Wolfy in and take me to the airport. I had never been in a limousine before so I thought “why not”. Lucky I did as Wolfy arrived late! The limo driver took me for coffee – and paid for it – while we waited for Wolfy. I didn’t have much time left to get to the airport once the paperwork was done. The thought of running uphill in the heat dragging a suitcase was terrifying so I am glad Paul came up with the limo idea. We made it home and were greeted by our pack. It was a stressful but fun adventure thanks to the wonderful people I met in Brisbane. Six months after his radiation therapy Wolfy went blind. We were told this might happen as they had needed to direct the radiation through his remaining eye. We were worried how he would cope with this but he dealt with his blindness in his usual stoic and heroic way. He remained happy and confident and would sun bake in the backyard as usual. When he wanted to come in he would simply bark and wait for me to pick him up. He did the same thing when he needed to go to the toilet or get off the couch. He even licked a path along the walls of the bedroom to the lounge so he could scent his way from the two rooms at his pleasure. The radiation therapy had greatly reduced the size of the tumour but by April 2012 it had started growing again. He surprised all the specialists by surviving for two years after his initial treatment. But he could only battle for so long. The above story And the Bagpipes Played was written shortly after we made the decision to let him go. I always knew I wanted to bury Wolfy in the backyard but I wasn’t sure what other memorial piece I wanted. There is so much on offer now for deceased pet mementoes. Nothing felt right until I saw a post on a pug forum about Shelter Pups, a dog charity in the USA that custom makes small stuffed dogs based on your own photos. 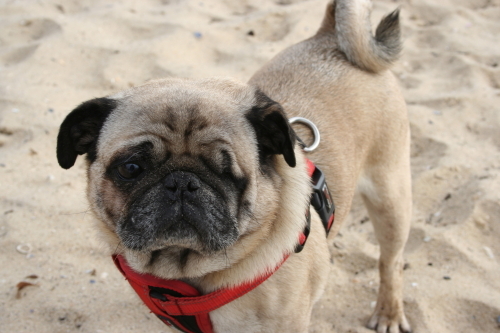 And that was what I wanted – a small, stuffed pug modelled on Wolfy’s face. Little Wolfy (what other name could he have!) flew from the USA and landed in Melbourne on Octo ber 31st – Northern Hemisphere Halloween. What a perfect time for a death memento to arrive. I couldn’t wait to pick him up. I even bought a little black and white bag to carry him around in when he goes visiting. He mostly sits on a tallboy with some very special pandas keeping his eye on us as we sleep. Some people have thought that Little Wolfy is creepy or macabre. I just think of him as one of the family. One year has passed since we brought Wolfy home from the vet, wrapped in his camouflage blanket, and buried him in the backyard. It hasn’t gotten any easier to get over his death. It’s just easier to cope with. Wolfy left a big hole in our hearts and our souls. The hole hasn’t gotten any smaller. It is still a hole and it still hurts. I know how much you and Michael loved Wolfy. I’m so glad he got to spend time with both of you and Elvis and Sunny. Thank you for the memories, the support and the friendship. 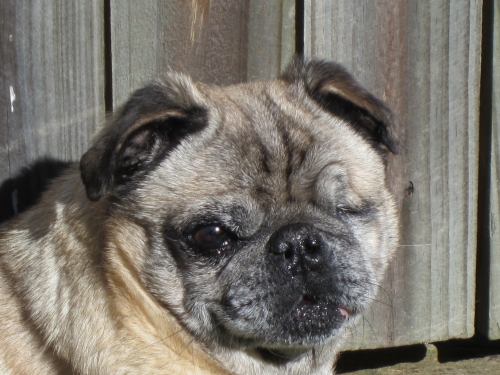 Wolfy was a very debonair pug I always thought of him as the Clark Gable of all pugs, he is very much missed. It is loading fine for me. A few of my friends have also said they are not having issues. I hope it’s not still a problem.